The last event of 2018 (for me) was the “March In” evening event at Valley Forge. My reasons for choosing events may be quirky: anything I can get to at Fort Ti, because I love that fort and landscape; MoAR events because they’re imaginative, not too far, and, bonus, I get to see my mom; anything immersive at which I’ll have tasks and a role; anything that gets me behind the scenes or gives me a new perspective on a site, museum, or event; anything that allows me to flex my interpretive muscles. March In gave me a new perspective, a new site, and a chance to expand my interpretive range. I loved it. My son, not so much. While I’d thought he’d enjoy it– he got us into this living history business, after all–since we’d visited Valley Forge every summer when we went to see my mom, and our parts would be small, progressive-focused scenarios. No wonder I found the evening chilly. I wasn’t too concerned about keeping warm after surviving and thriving in Princeton. The weather on December 19th seemed, if not balmy, seasonably pleasant, so I left off a layer or two from the Princeton list, skipping the third neck handkerchief. My bonnet this time was an old woolen “stuff” bonnet made back when my bonnet obsession first began. 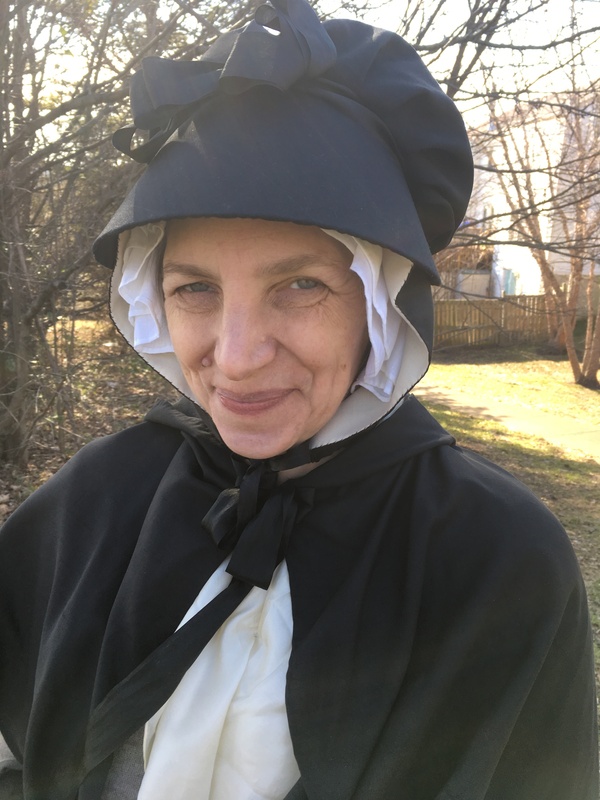 In the April 8 1776 Pennsylvania Packet, an ad for runaway Margaret Collands records that she was wearing “a redish coloured worsted bonnet.” My choice seemed pretty apt for winter in Pennsylvania, and, lined with linen, I can confirm my head stayed warm. My neck was not! At Princeton, I solved the neck draft problem by tying my third neck handkerchief around the neck of my cloak hood (see above). 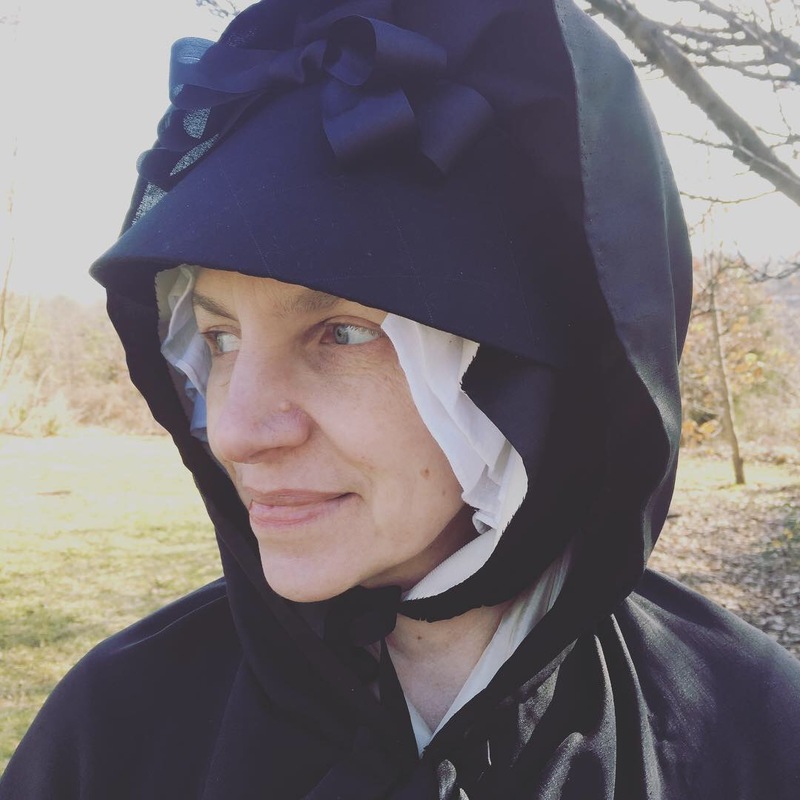 When I came home from Valley Forge, I went shopping in the historical record to see what I could find: hoods. Close-fitting hoods, worn over caps. Some velvet, some, possibly, quilted. I also found bonnets with “quilted crowns,” which I think may describe quilted hoods. The title is taken from Tench Tilghman to John Cadwalder in Boyle, Writings from the Valley Forge Encampment, 1:26 “Our Men have all got comfortably covered in their Huts and Better quarters are not in the World…” Tench Tilghman to John Cadwalader, Valley Forge, 18 January 1778. *More on this another time, but yes: he’s still alive and well and seems happy enough for an enormous 20-year-old home with a classic college break cold. It’s astonishing to me, in a way, that I haven’t posted about this before, but shockingly, I have not. Remember the need to keep warm in Princeton? Tested on at Ti? A compromise? I updated that garment and wore a nearly-completed version at Ti last February but never wrote about the new version: the Squirrel Waistcoat. Wool hand-quilted to a wool backing and lined with wool, I wore this almost finished at Fort Ti last February, and found it comfortable and cozy. I had imagined its state to be far worse than it was: with a lining in need of piecing, mangled seams, your worst nightmare come true. But no: all it really needed was some binding adjustment, not surprising considering that I stitched the binding by candlelight while chattering away with friends over cider. The back pieces weren’t bound at all, but because I’d imagined this needed so much more work than it did, I put it aside until now, when I know I will want it for a weekend in Trenton, and another at Ti in December. All it took was a little time, and accepting that the bindings will not match. This wasn’t a long, involved project, really, though I spent lunch hours and evenings working on it last January and February. It is, as so many things are, about patience. Patience and good needles. The construction was based on the quilted waistcoat I made two years ago, with a pattern derived from Sharon Burnston’s research, using fitting adjustments I’d made to an earlier jacket pattern (long since abandoned due to living in New England). I don’t fully remember how it fits best, over or under my stays, but I’ll get a couple of opportunities to test drive the layers in the next two weeks. And in the meantime? Squirrel! Can I get an “Aw, yiss” for being warm outdoors? After the aftermath. Photo by Drunk Tailor. They may not be the most accurate <cough>machinestitchedoffabolt<cough> quilted petticoat and waistcoat, but they sure do make a difference. The underneaths. Photo thanks to Drunk Tailor. It isn’t always pretty, but in cold, wet weather, function trumps fashion (not that I’m not pretty pleased with this upholstery). The waistcoat ties on, so you have some adjustment should your weight or shape fluctuate. The petticoat, in this case, works like every other petticoat, with the sole exception of a short pocket slit on one side due to operator impatience (this was finished just a few days before it needed to be packed for Princeton). Thanks to Drunk Tailor for more patience. The quilted fabric (originally intended, I am sure, for a bedspread) is lined with a plain weave wool for extra insulation and body; the waist band is bound with wool tape, as is the hem. Down in the basement, there’s a camblet- wool batting- linen lining sandwich on a frame, ready for quilting, if I only I would drag it up stairs and start, and I know it would be both more insulating and more accurate. Does it all fit? Well…pretty much! 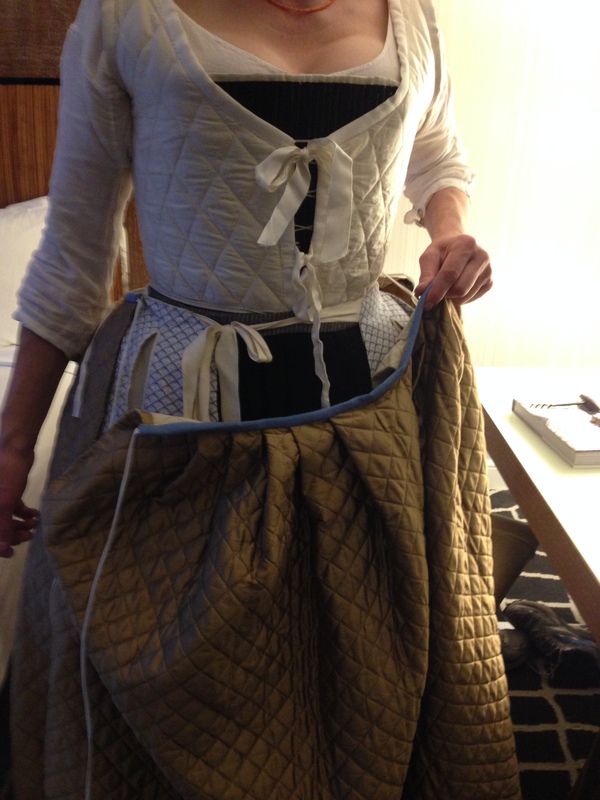 An open robe with stomacher makes it easier to fit all these layer underneath, and, happily, I don’t have the best sense of my own size, so my clothes tend to be a little bigger than they must be. Fortunately, historical clothing generally involves adjustable closures that make fluctuations and layering easy to accommodate. 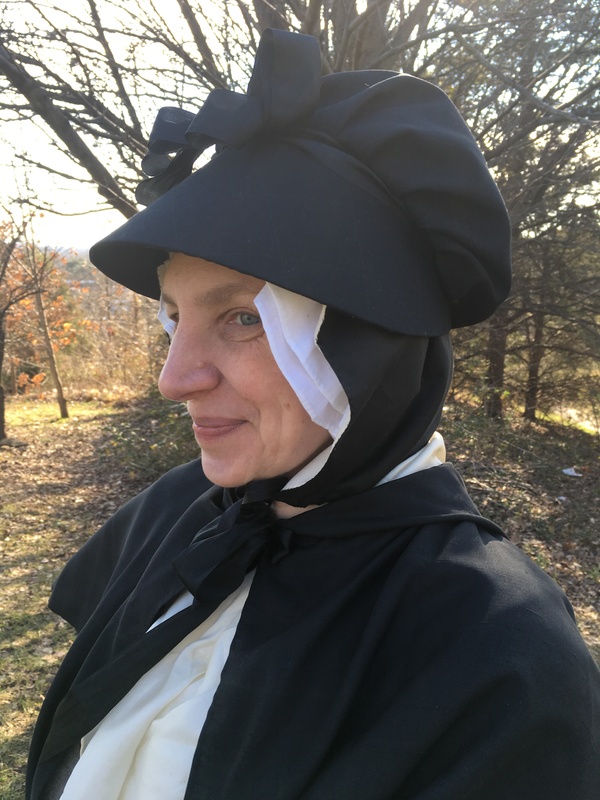 After Anna B’s and Anna K’s comments on the overview of the event, I was reminded that these are the confessions of a known bonnet-wearer, and I will humiliate self for history, so in case you are wondering: no, I didn’t wear drawers of any kind, or leggings, or long underwear. A pair of silk stockings under a pair of wool stockings kept my lower extremities warm, but my nethers were sometimes chilly, in a highly specific, localized, but small way. I think this may be where the wool shift comes in– or one that fits a bit better than my current garment, which is a tad too large. When it comes to ears, you can see that we adopted a range of solutions. Ear-covering caps under bonnets, under straw hats, and under kerchiefs, were worn by some. At far left, my cap perched on top of my head, so I tied my bonnet on with a kerchief and pulled my hood over all of that. Mistress V (at far right) wore a cap, a kerchief and a hat (which was summarily removed in the afternoon, by Mistress S at her left). Mistress F, holding the cream colored blanket with a wide black stripe, wore a wool hood over a cap and under her straw hat. Wear enough layers– and the right layers, meaning mostly wool and silk– and you will be warm, perhaps even sweaty if you’re active. 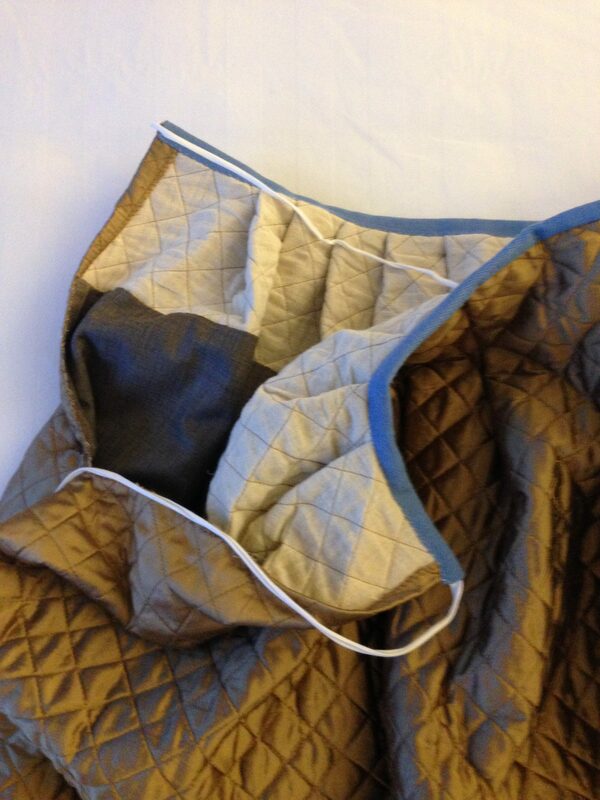 Still, I might trade in my “Hobo Woman of Princeton” look for a quilted silk hood if the right one came along. What if they had a reenactment and there was no battle? Can you really interpret military history without a battle? Why yes; yes, you can. And you can do it well, engaging and exciting visitors and interpreters alike. 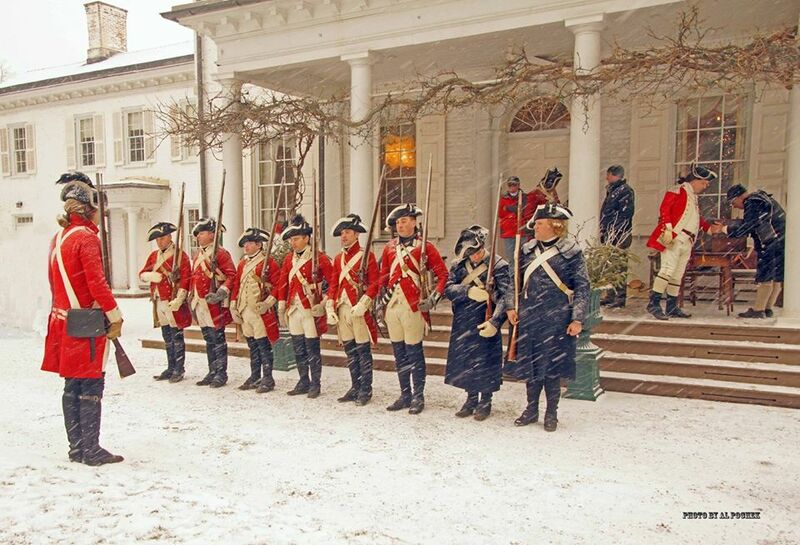 Last Saturday, Princeton was under British occupation once again, as we recreated the winter of 1777 this past weekend. I joined the planning for this back in October– I double checked– and it really started months before that. Many hands (and imaginations) make events like this work, but for me, the most exciting part was helping to produce an essentially civilian day of programming that interpreted the Revolutionary War in New Jersey. Yes, there was “a musket thing” mid-day, but that wasn’t the focus of the action. The ink froze, but oaths were to be signed anyway. HM 17th Regiment made their base of operations/occupation the porch of Morven House (formerly Richard Stockton’s residence) while the populace of Princeton attempted to go about their daily lives in Palmer Square. Quakers found themselves pressed to sign the Oath of Allegiance to King George III, despite their protestations that they could not take sides in a war. The constant snow kept our shoes on, but goods were stolen, occupants assaulted, soldiers beaten, prisoners taken, and justice served. The British failed to win the “hearts and minds” of New Jersey residents because they turned liberation into occupation. The British lost the war in New Jersey because they treated everyone as a traitor. The revolutionary war in New Jersey was as much a civil war as a rebellion against the crown. I count that a major win for living history.